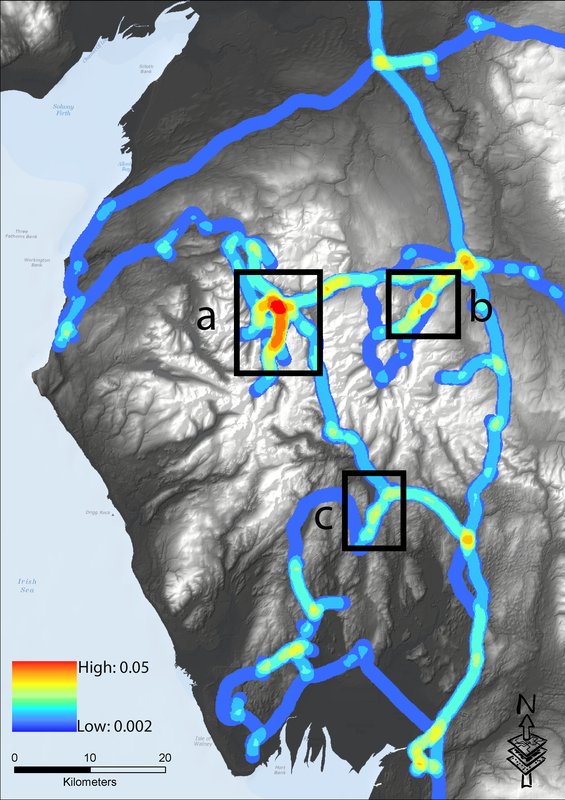 The Lake District is an ideal focus for a study that uses GIS because it’s a region that has long been portrayed in poems, guidebooks and paintings. One thinks of Wordsworth, West and Turner, of course, but one can also think of an array of writers and artists (from Celia Fiennes and Daniel Defoe to Alfred Wainwright and the Abraham Brothers) who have shaped our perception of Lakeland and its landscapes. 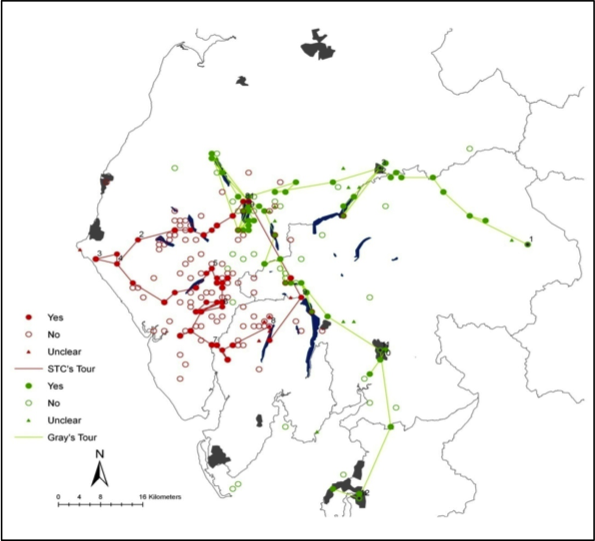 The pilot study our team conducted five years ago sought to show how GIS technology could help researchers analyse the accounts of historical Lake District tourists and explore how representations of the region have changed over time. This study focused on two famous accounts of the English Lake District: Thomas Gray’s epistolary journal of his tour of 1769 and the letters and notes Samuel Taylor Coleridge composed during his ramble through the western fells in 1802. Although these texts are ostensibly accounts of the same landscape, a GIS mapping of them reveals a set of radically divergent patterns. Significantly, these divergent patterns point up a number of the key differences between Gray’s and Coleridge’s excursions. : This comparative map of the tours of Gray (Green) and Coleridge (Red) shows the distribution of the various places each writer mentioned and/or visited. Gray’s tour, as this comparative map illustrates, was a fifteen-day trip by coach and horseback from Brough to Lancaster via the picturesque scenes of Ullswater, Keswick and Thirlmere. Coleridge’s tour, by contrast, was a nine-day odyssey taken on foot from the writer’s house in Keswick to the coastal village of St. Bees, and thence famously over Scafell Pike to Eskdale and Coniston before returning homeward over Dunmail Raise. In a certain sense, these contrasting routes would seem to complement the contrasting temperaments of the two authors themselves—with Gray’s linear, measured movements countering Coleridge’s erratic meanderings. Yet, these routes can also be seen to indicate crucial differences in touristic attitudes and practices. Gray’s account, though famously one of the earliest documents of its kind, exemplifies many of the tendencies of later picturesque tourism in the Lake District. Gray travelled on coach roads, in a route that took him through densely populated areas to sites of visual grandeur and beauty. He was, in so many words, an outsider who came to the Lakes with a Claude-glass in his pocket and an itinerary in his hand. Coleridge, by contrast, was a resident of the region at the time he set off for the western fells, and his irregular route would seem to reflect a desire to avoid well-trodden paths and instead to seek new experiences and sensations. In short, whereas Gray was rather unabashedly what we would call a tourist, Coleridge would have likely seen himself as a traveller. More information about this pilot study can be found on the project’s website. Here it suffices to say that noticing these sorts of patterns has convinced us of two things: firstly, that working with GIS can help us assess the experiences of individual travellers; and secondly, that whereas the Lake District is unified by a common set of associations, historical accounts of the region can be surprisingly heterogeneous. This is, in large part, what motivates our current research. Effectively, we’re in the process of creating a fully geo-referenced digital corpus to analyse the development of the Lake District as a cultural landscape between the early-seventeenth and early-twentieth centuries. To date, this corpus consists of 80 digitized texts, comprising well over 1,500,000 words and spanning from the 1622 edition of Michael Drayton’s Poly-Olbion to the twenty-second edition of Black’s Shilling Guide to the English Lakes, which was published in 1900. The full list of texts includes a number of well-known works, such as the guidebooks of Lakeland luminaries like William Wordsworth and Harriet Martineau. Importantly, however, it also features the works of dozens of lesser-known writers, including Priscilla Wakefield, W. G. Collingwood and the Lancashire dialect poet Edwin Waugh. This mixture of sources is significant, because one of the main benefits of working with large corpora of historical books and manuscripts is that it allows us to generate more historically nuanced interpretations. By situating canonical texts, such as Wordsworth’s Guide, alongside popular tourist publications, such as Black’s Shilling Guide, we can perform far more comprehensive analyses of how the Lake District was perceived, experienced and represented in the past. 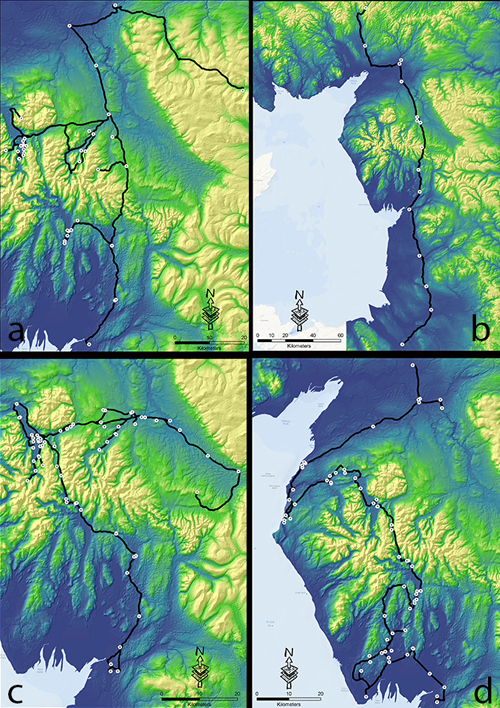 In performing these analyses we utilize not only traditional GIS techniques, but also exploratory GIS-based methodologies and mapping tools, all of which are employed in order to achieve three principal objectives: a) to create better models of the journeys documented in historical and literary journals, guidebooks and travelogues; b) to identify the geographical areas that might have played a fundamental role in these texts; c) to assess the influence that specific tracks, roadways and routes might have had on the way those areas are perceived and represented. In order to facilitate these analyses, we’ve also begun to develop exploratory mapping tools and techniques. This past December, for example, we completed a case study using GIS-based approaches to create more accurate representations of the routes travelled and described by Gray and two other famous eighteenth-century Lake District tourists: Arthur Young, who paid a visit to the Lakes on his Six Months’ Tour of Northern England in 1768, and Thomas Pennant, who passed through the region during his two tours to Scotland in 1769 and 1772. This comparative map shows the routes followed by (a.) Young in 1768, (b.) Pennant in 1769, (c.) Gray in 1769 and (d.) Pennant in 1774. One of the most significant insights gained from this study is that all three writers, without exception, relied on local carriage roads and turnpikes. At first glance this may seem a minor point, but it is of manifest importance. For although scholars have long credited the accounts of early Lakeland travellers, such as John Dalton, with attracting tourists to the region, they have generally paid less attention to how the improvement of local roadways during the 1750s and ’60s influenced those tourists’ tours. As Paul Hindle (one of very few exceptions to this trend) has observed, the influence of these improvements was twofold. For they not only established standard routes that afforded swifter and safer access to several of the region’s main settlements, but also, in doing so, distinguished the places connected by, or at least visible from, these routes as the sites most worthy of the tourist’s attention. Thus, it makes sense that the parts of the landscape identified amongst those most frequently travelled are located in the eastern half of the region (around the lakes of Ullswater, Derwentwater and Windermere), since these were the sites around which the majority of road improvements occurred. This line-density map displays the routes travelled by Gray, Young and Pennant (notice the similarity to Hindle’s map of 18c turnpikes below). It also indicates the relative frequency of places mentioned. Sites of high frequency include a.) Derwentwater; b.) Ullswater; c.) Windermere. Incidentally, this also helps to explain why neither Gray nor Young nor even Pennant—who travelled through much more of Cumberland—set foot in the (now iconic) western valleys of Wasdale and Ennerdale. For although turnpike acts were passed to improve access to this area in 1750 and ’62, the roads in this remote part of the country remained in disrepair well into the nineteenth century. 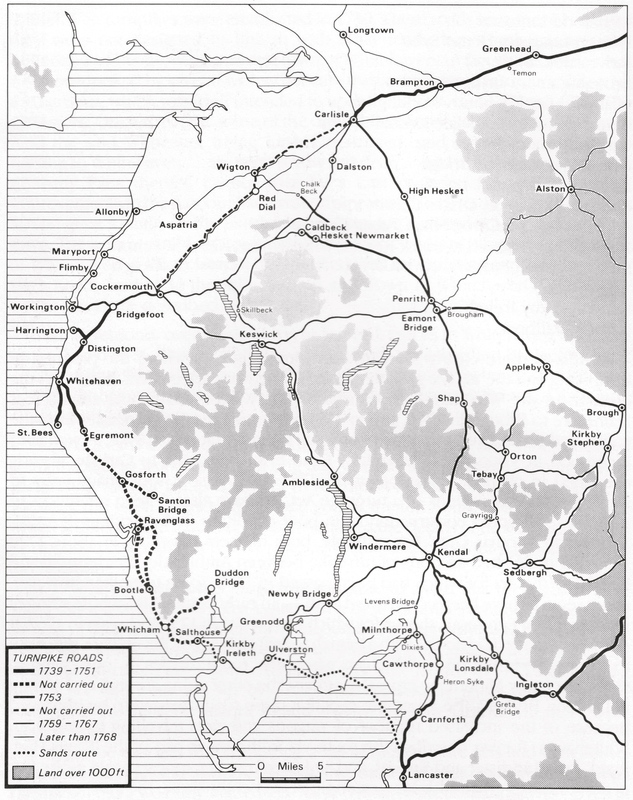 18c Turnpike Roads in Cumberland, Westmorland and Lancashire, from Paul Hindle’s Roads and Tracks of the Lake District (Cicerone, 1998). Re-used with the author’s permission. We hope to continue updating you about the progress of the project over the next several months. In the meantime, we’d be keen to hear your thoughts about our findings.